The evolution of metazoans from their unicellular ancestors was one of the most important events in the history of life. However, the cellular and genetic changes that ultimately led to the evolution of multicellularity are not known. In this study, we describe an aggregative multicellular stage in the protist Capsaspora owczarzaki, a close unicellular relative of metazoans. Remarkably, transition to the aggregative stage is associated with significant upregulation of orthologs of genes known to establish multicellularity and tissue architecture in metazoans. We further observe transitions in regulated alternative splicing during the C. owczarzaki life cycle, including the deployment of an exon network associated with signaling, a feature of splicing regulation so far only observed in metazoans. Our results reveal the existence of a highly regulated aggregative stage in C. owczarzaki and further suggest that features of aggregative behavior in an ancestral protist may had been co-opted to develop some multicellular properties currently seen in metazoans. When living things made from many cells evolved from single-celled ancestors, it was a breakthrough in the history of life—and one that has occurred more than once. In fact, multicellular life has evolved independently at least 25 times, in groups as diverse as animals, fungi, plants, slime molds and seaweeds. There are broadly two ways to become multicellular. The most complex multicellular species, such as animals, will replicate a single cell, over and over, without separating the resultant cells. However, in species that are only occasionally multicellular, free-living cells tend instead to join together in one mass of many cells. Evolution is constrained by its raw materials; so looking at the living relatives of a given species, or group, can lead to a better understanding of its evolution because its relatives contain clues about its ancestors. To gain insights into how animal multicellular life might have began; Sebé-Pedrós et al. studied the life cycle of the amoeboid organism Capsaspora owczarzaki. Found within the bodies of freshwater snails, this single-celled amoeba is a close relative of multicellular animals and could resemble one of their earliest ancestors. At certain stages of the life cycle Sebé-Pedrós et al. noticed that individual amoebae gathered together to form a multicellular mass—something that had not been seen before in such a close relative of the animals. Moreover, the genes that ‘switched on’ when the amoebae began to aggregate are also found in animals; where, together with other genes, they control development and the formation of tissues. Sebé-Pedrós et al. suggest that the first multicellular animals could have recycled the genes that control the aggregation of single-celled species: in other words, genes that once controlled the changes that happen at different times in a life cycle, now control the changes that develop between different tissues at the same time. Sebé-Pedrós et al. also observed that alternative splicing—a process that allows different proteins to be made from a single gene—occurs via two different mechanisms during the life cycle of Capsaspora. Most of the time Capsaspora employs a form of alternative splicing that is often seen in plants and fungi, and only rarely in animals; for the rest of the time it uses a form of alternative splicing similar to that used by animal cells. The evolution of complex alternative splicing mechanisms is a hallmark feature of multicellular animals. The exploitation of two major forms of alternative splicing in Capsaspora could thus reflect an important transition during evolution that resulted in an increased diversity of proteins and in more complex gene regulation. Such a transition may ultimately have paved the way for the increased specialization of cell types seen in animals. This glimpse into the possible transitions in gene regulation that contributed to the birth of multicellular animals indicates that the single-celled ancestor of the animals was likely more complex than previously thought. Future analyses of the animals’ close relatives may further improve our understanding of how single-celled organisms became multicellular animals. Living organisms emerged from the integration of multiple levels of organization. These levels were shaped by both physiochemical constraints and historical circumstances, the latter being more important in more complex systems (Jacob, 1977). Therefore, it is important to identify the phylogenetic inertia (sensu Burt, 2001) imposed by the raw starting material in order to properly understand major evolutionary transitions, such as the origin of metazoan multicellularity (Knoll, 2011). Examination of both the genetic repertoire (King, 2004; Ruiz-Trillo et al., 2007; Rokas, 2008) and the cell types present in the immediate unicellular relatives of metazoans can provide insights into this evolutionary transition, as they reveal the historical constraints in early metazoan evolution. In this regard, the analyses of unicellular holozoan genomes, that is choanoflagellates and filastereans, have shown that the genetic repertoire of the metazoan unicellular ancestor was much more complex than previously thought (Abedin and King, 2008; King et al., 2008; Sebé-Pedrós et al., 2010; Suga et al., 2013). Multicellularity has been independently acquired multiple times during the evolution of eukaryotes, in more than 20 different lineages including animals, plants, fungi, slime molds, green and brown algae, and several other eukaryotes (King, 2004; Parfrey and Lahr, 2013). Multicellular organisms evolved through two major strategies: aggregation of different cells or clonal division of a single cell. Multi-level selection theory has proposed that the most complex multicellular organisms likely arose through clonal development rather than by aggregation of genetically diverse cells, since intra-organismal competition in the latter might be expected to be evolutionarily unstable (Grosberg and Strathmann, 2007; Michod, 2007; Newman, 2012). Accordingly, eukaryotic lineages that attained the most complex multicellular lifestyles (i.e., plants and metazoans) arose through clonal cell division (Grosberg and Strathmann, 2007). In contrast to clonal multicellularity, aggregative cell behavior typically represents a transient life cycle stage. This type of multicellularity arose within several eukaryotic clades, including the dictyostelids (Amoebozoa) (Schaap, 2011), acrasid amoebas (Heterolobosea, Discicristata, Discoba) (Brown et al., 2011), Guttulinopsis vulgaris (Cercozoa, Rhizaria) (Brown et al., 2012), the genus Sorogena (Ciliata, Alveolata) (Lasek-Nesselquist and Katz, 2001), the holomycota Fonticula alba (Opisthokonta) (Brown et al., 2009) and the genus Sorodiplophrys (Labyrinthulomycetes, Heterokonta) (Dykstra and Olive, 1975) (Figure 1). 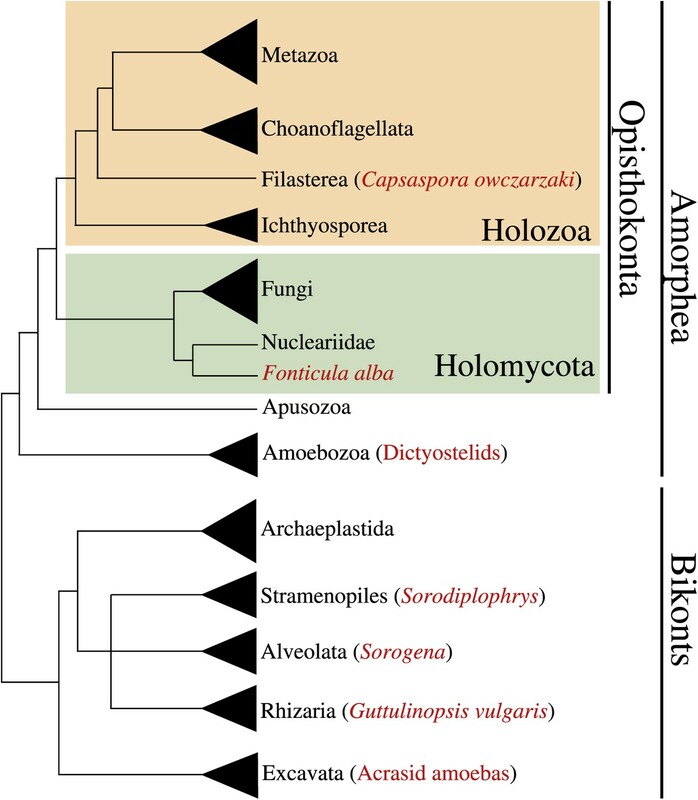 Phylogenetic position of Capsaspora owzarzaki within the eukaryotes. The Holozoa clade (in yellow) includes Metazoa and their closest unicellular relatives: Choanoflagellata, Filasterea, and Ichthyosporea. C. owczarzaki represents one of the two known filastereans taxa that form the sister-group of choanoflagellates and metazoans. Other major eukaryotic groups are shown. Within each group, species or clades with aggregative multicellularity (see text) are highlighted in red. Within the opisthokont clade that comprises Metazoa, Fungi and their unicellular relatives (Cavalier-Smith, 2003; Steenkamp et al., 2006; Ruiz-Trillo et al., 2008), so far only a single taxon has been described to have aggregative behavior, which is F. alba (Brown et al., 2009), a close relative of Fungi. Moreover, among close unicellular relatives of Metazoa, clonal development is the only known multicellular behavior, as described in choanoflagellates and ichthyosporeans (Dayel et al., 2011; Suga and Ruiz-Trillo, 2013). Within metazoans, which have largely clonal development, some cells show aggregative behaviors; for example, mesenchymal (O’Shea, 1987) and germ line cells (Savage and Danilchik, 1993) during development, sponge cells after cell dissociation (Wilson, 1907) and arthropod blood cells through active amoeboid movement (Loeb, 1903, 1921). 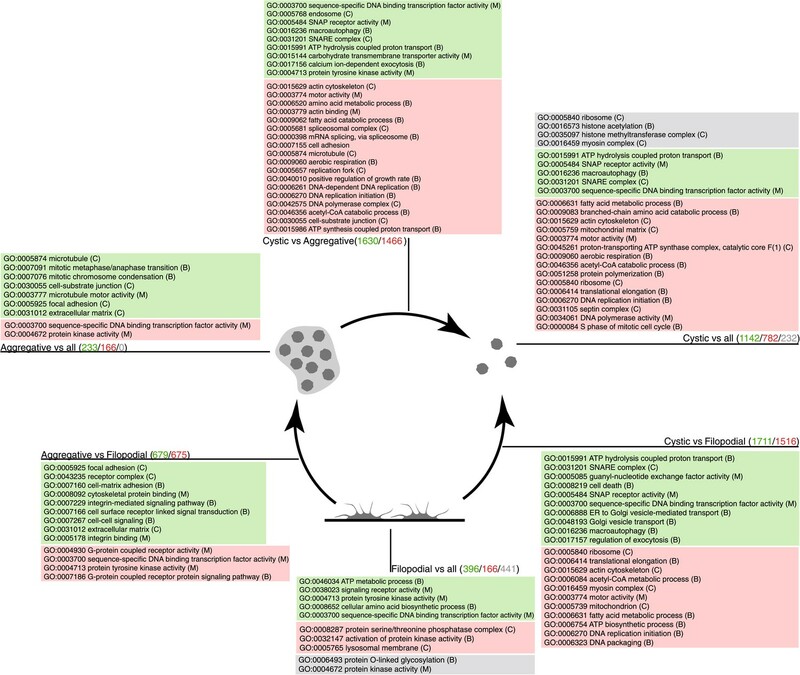 To gain deeper insight into the possible transitions that arose during the emergence of metazoan multicellularity, we have performed a detailed examination of the life cycle and associated transcriptomic changes of Capsaspora owczarzaki, one of the closest known unicellular relatives of metazoans (Figure 1). Isolated decades ago as an endosymbiont of the fresh-water snail Biomphalaria glabrata (Owczarzak et al., 1980), C. owczarzaki belongs to the clade Filasterea, the sister-group of Metazoa and choanoflagellates (Torruella et al., 2012). Filasterea also includes a free-living marine unicellular species known as Ministeria vibrans (Shalchian-Tabrizi et al., 2008). We analyzed the C. owczarzaki life cycle and its regulation using electron microscopy, flow cytometry and high-throughput RNA sequencing (RNA-Seq). Through these analyses, we show that C. owczarzaki life cycle is tightly regulated at the level of gene expression and alternative splicing (AS). Moreover, we demonstrate the existence of an aggregative multicellular stage in C. owczarzaki in which many orthologs of genes important for metazoan clonal multicellularity are upregulated. Under initial culture conditions (‘Materials and methods’), C. owczarzaki differentiates into an amoeba that crawls over substrate (Video 1), surveying its environment with its filopodia (Sebé-Pedrós et al., 2013). At this stage, active DNA replication occurs (with >10% of the cells in S-phase) and, within 48 hr, the cells enter an exponential growth phase (Figures 2 and 3). Subsequently, the cells start to detach from the surface and begin to retract their filopodia and encyst (Figure 3B,C). After 8 days, no attached amoebas remain and growth is stabilized (Figures 2 and 3). This cystic stage may represent a dispersal resistance form. Strikingly, we observe an alternative path to this process involving the active formation of cell aggregates (Videos 2 and 3). In these aggregates, the cells attach to each other and produce cohesive extracellular material (Figure 3D) until a compact cell aggregate, in which cells no longer bear filopodia, is formed (Figure 3E). Transmission electron microscopy demonstrates the presence of a thick, unstructured, extracellular material within the aggregates that appears to prevent direct contact between cells (Figure 3F). Clusters of cells appear to occur at random under normal culture conditions. C. owczarzaki filopodial amoeba stage cells crawling. Dark and refringent vesicles can be observed inside each cell. Up to nine different cells can be observed in the video. Also available on YouTube: http://youtu.be/0Uyhor_nDts. Flow-cytometry analysis of C. owzarzaki cell cycle. (A) Total number of cells per day in each fraction (adherent and floating, see ‘Materials and methods’). (B) Proliferation rate per day. (C) Percentage of cells in S-phase per day and two examples of DNA-content profiles obtained from days 3 and 11. Note the reduction in the number of G2/M cells (second peak) and the drastic reduction in S-phase cells (the area between the two peaks). Data from adherent cells (‘Materials and methods’) is shown in green and data from floating cells in red. Experimental replicate 1 results are shown with solid lines and replicate 2 results with dashed lines. (A) Filopodial stage cells, amoebas with long filopodia. (B) Transition from filopodial to cystic stage: cells retract filopodia. (C) Cystic stage cells are rounded cysts without filopodia and slightly smaller than filopodial cells. (D) Transition from filopodial to aggregative stage: cells attach to each other and an extracellular matrix appears. (E) Mature aggregate. (F) Transmission EM showing adjacent cells in the aggregate separated by extracellular matrix. Arrows indicate the observed stage inter-conversions. Scale bars = 1 μm, except in panel D = 200 nm. Also available on YouTube: http://youtu.be/83HB8srWQw4. Also available on YouTube: http://youtu.be/OvI6BvBucrc. To investigate whether C. owczarzaki cell clusters are formed through aggregation or clonal division, we first mixed two differentially stained populations of cells (‘Materials and methods’) and induced aggregate formation, resulting in dual-colored cell clusters (Figure 4A). This indicates that cell clusters are not composed of daughter cells resulting from successive cell divisions, which would result in single-color cell clusters, but instead by aggregation of multiple cells. We also observed that aggregates could form efficiently even when cell division was blocked by two different inhibitors, hydroxyurea and aphidicolin (Figure 4B). Finally, by flow cytometry, we observed that the proliferation rate of aggregative cells (Figure 4—figure supplement 1) is extremely low (compared with the observations in Figure 2). Overall, these results show that C. owczarzaki cell clusters form by active cell aggregation, not by clonal cell division. This observation represents the first reported case of aggregative multicellularity in a close unicellular relative of Metazoa. C. owczarzaki cell clusters form by active aggregation, not clonal cell division. Aggregation was induced in different stained cell populations (‘Materials and methods’). (A) Left, population of cells stained with Lysotracker (green), uniformly green aggregates are formed. Center, population of cells stained with Chormeo Mitochondrial Staining (cyan), uniformly cyan aggregates are formed. Right, two independently stained populations of cells (green or cyan) are mixed and dual color aggregates are formed, indicating that cells from different origins aggregate to each other. (B) Total number of cells per day in control cells, aphidicolin-treated cells and hydroxyurea-treated cells. Note that cell division is blocked by both aphidicolin and hydroxyurea. Aggregate formation was evaluated under each condition. All cells, even those treated with aphidicolin or hydroxyurea, developed aggregates. A representative aggregate is shown for each condition. Scale bars= 10 μm. The aggregative multicellularity observed in C. owczarzaki adds an additional cell behavior to those already known among extant close unicellular relatives of Metazoa (i.e., choanoflagellates, ichthyosporeans, and filastereans [Torruella et al., 2012]). We can then infer that multiple cell types and behaviors (including aggregative behavior, flagellar motility, amoeboid movement, clonal colony formation, etc) were most likely present among the unicellular ancestors of metazoans. This range of cell behaviors may have provided the basis for the evolution of the diverse cell types seen in animals (Arendt, 2008; Arendt et al., 2009). Interestingly, each one of the three known unicellular lineages closely related to Metazoa (choanoflagellates, ichthyosporeans and filastereans) has some kind of simple multicellularity. Moreover, the tight regulation observed in C. owczarzaki (see below) emphasizes that a regulated temporal cell differentiation was already in place among unicellular ancestor of animals. This reinforces the view that, during the transition to animal multicellularity, ancestral premetazoan cell types may have been integrated into a single multicellular entity by means of controlling cell differentiation spatially, rather than temporally (Mikhailov et al., 2009). An alternative explanation is that some of the cell behaviors observed in extant unicellular relatives of Metazoa may had evolved independently in some particular unicellular holozoan lineages or species, and do not represent ancestral states. The limited taxon sampling in many of these poorly studied lineages makes it difficult to reliably assess whether these are derived or ancestral characters and this situation is especially dramatic in the case of filastereans, in which only two species have been described so far (C. owczarzaki and the free-living M. vibrans). 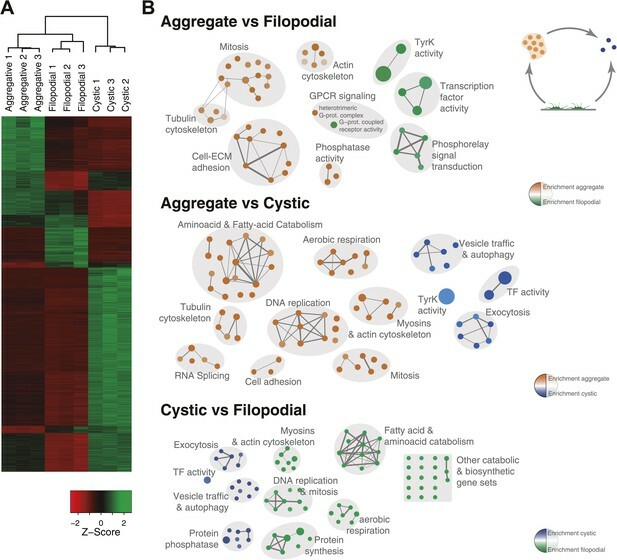 To investigate the molecular composition and regulation of the distinct life cycle stages of C. owczarzaki, we isolated filopodiated amoebae, aggregates, and cysts, and analyzed their transcriptomes using RNA-Seq. Of 8637 annotated genes, 4486 showed statistically significant differential regulation (‘Materials and methods’) in one or more pair-wise comparisons between life cycle stages, including 1354 changes between filopodial and aggregate stages, 3227 between filopodial and cystic stages, and 3096 between aggregate and cystic stages. Moreover, when performing one-versus-all comparisons, each cell stage had a specific transcriptomic profile (Figure 5A), indicating tight regulation at the level of gene expression. Using both pairwise and one-versus-all comparisons, we identified significantly enriched gene ontology (GO) categories (Figures 5 and 6) and Pfam protein domains (Figure 7) in each set of differentially expressed (both up and down-regulated) genes (p<0.01 for each significant category; Fisher’s exact test). Genes upregulated in the filopodial stage were enriched in signalling functions, such as tyrosine kinase activity and G-protein-coupled receptor activity, as well as in transcription factors, especially of the Basic Leucine Zipper Domain (bZIP) superfamily (Figures 5 and 6). Genes involved in protein synthesis and DNA replication were also significantly upregulated, consistent with the rapid cell proliferation at this stage observed by flow cytometry (Figure 2), and further suggesting a high metabolic rate. Differential gene expression in C. owczarzaki. (A) Heatmap showing differential gene expression in the different biological replicates of each stage. Only genes with cRPKM ≥ 5 in at least one sample and with a 2-fold expression change in at least one pair-wise comparison are shown. (B) Gene set enrichment analysis (GSEA) for the different cell stages (‘Materials and methods’). Orange represents enrichment in the aggregative stage, blue in the cystic stage, and green in the filopodial stage, with color intensity proportional to enrichment significance. The node size is proportional to the number of genes associated to the GO category, and the width of the edges is proportional to the number of genes shared between GO categories. Groups of functionally related GOs are manually circled and assigned a label. GO enrichment in sets of differentially expressed genes. Pairwise (Aggregative vs Filopodial, Cystic vs Aggregative and Cystic vs Filopodial) and one-versus-all comparisons are indicated. The significantly overrepresented GO categories (‘Materials and methods’) are shown for sets of overexpressed (green) and downregulated (red) genes and for genes with differential intron retention (gray). The number of genes included in each set is indicated with the same color code. Pfam protein domain enrichment in sets of differentially expressed genes. Pairwise (Aggregative vs Filopodial, Cystic vs Aggregative and Cystic vs Filopodial) and one-versus-all comparisons are indicated. Significantly overrepresented Pfam domains (‘Materials and methods’) are shown for sets of overexpressed (green) and downregulated (red) genes and for genes with differential intron retention (gray). The number of genes included in each set is indicated with the same color code. Those Pfam domains mentioned in the text are shown in bold. When compared to filopodial and aggregative cells, cystic cells showed significant downregulation of genes associated with myosin transport, translation, DNA replication and metabolic activities (especially mitochondrial energy production). However, genes involved in vesicle transport and autophagy were significantly upregulated at this stage (Figure 5). These differences may reflect recycling of intracellular components triggered by starvation or other adverse conditions, as has been observed under conditions of adaptive cell survival in other eukaryotes (Kiel, 2010). Protein domains involved in the ubiquitin pathway (e.g., UQ_con, zf-RING2 and Cullin domains) and in synaptic cell–cell communication, such as SNARE, synaptobrevin and syntaxin, as well specific transcription factor families (e.g., bHLH transcription factors), were also significantly upregulated in the cystic cells (Figure 7). Altogether, these results suggest that major cytosolic rearrangement and protein turnover occur at the cystic stage. Remarkably, the aggregative stage showed strong upregulation of the components of the integrin adhesome and associated signalling and cell-adhesion proteins (Figures 5 and 8A,B), such as the LamininG domain-containing protein CAOG_07351 (which contains a N-terminal signal peptide sequence and therefore is likely to be secreted) (Figure 8C), the IPP complex (ILK-PINCH-Parvin) signalling module, G-protein α-13 (Gong et al., 2010), several cytoplasmatic tyrosine kinases (Hamazaki et al., 1998) and two receptor tyrosine kinases (which possess extracellular DERM [Lewandowska et al., 1991] and fibronectin_3 domains, known to interact with integrins [Figure 8C]). 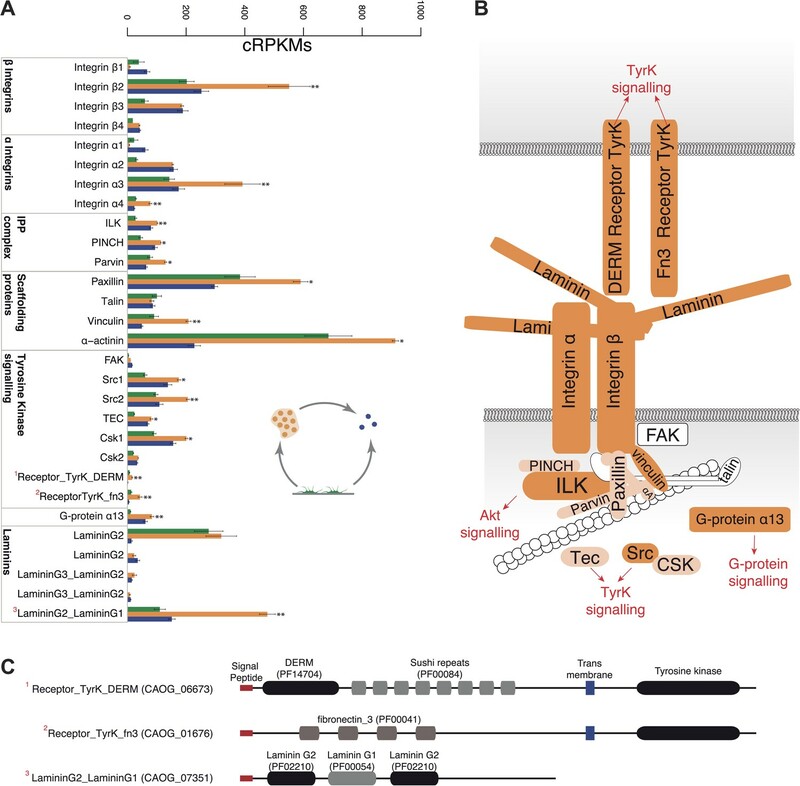 These observations strongly suggest that the integrin adhesome and the likely associated tyrosine kinase signalling genes play an important role in the formation of the C. owzarzaki aggregates. Furthermore, we also observed upregulation of genes involved in mitosis and in the tubulin cytoskeleton (e.g., kinesins) at the aggregative stage (Figure 5). These results indicate that a molecular repertoire associated with animal multicellularity, could function either in aggregative or in clonal multicellularity and in different phylogenetic contexts, in line with previous hypotheses (Newman, 2012). Expression of cell–ECM adhesion genes. (A) Barplot of the expression values of each gene in the different stages, showing overexpression of most components in the aggregate stage (orange). Asterisks indicate that the gene is significantly differentially expressed in both (two asterisks) or only one (one asterisk) pair-wise comparison (agg. vs fil. and agg. vs cyst.). Bars show standard error. (B) Schematic representation of the putative C. owczarzaki integrin adhesome and putative associated signalling proteins, colored according to overexpression in aggregates as shown in the barplot (dark orange, two asterisks; light orange, one asterisk; and white, no differences in expression). (C) Specific protein domain architectures for the fibronectin and DERM receptor tyrosine kinases (CAOG_01676 and CAOG_06673) and for the laminin protein (CAOG_07351). A hallmark feature of the evolution of metazoan multicellularity and cell type diversity is the expansion of AS complexity and regulation through exon skipping, which has entailed the formation of cell type-specific networks of co-regulated exons belonging to functionally related or pathway-specific genes (Irimia and Blencowe, 2012). In contrast, differential intron retention is the most widespread form of AS found in non-metazoan eukaryotic species (McGuire et al., 2008). To assess the extent to which these forms of AS may contribute to gene regulation in C. owczarzaki, we systematically mapped reads from each life cycle stage to a comprehensive set of intron–exon and exon–exon junctions (i.e., formed by exon/intron inclusion and skipping) to score their differential usage. Of 25,677 introns with sufficient RNA-Seq read coverage across the three life cycle stages, 2986 (11.6%) showed ≥20% PSI (Percent Spliced In, percent of transcripts from a given gene in which the intron sequence is present) in at least one stage, and approximately a third of genes had at least one such intron retention event. Moreover, we observed marked differences in the extent to which detected intron retention is differentially regulated between the different life cycle stages (Figure 9A). In particular, 797 retained introns (in 441 genes) and 259 retained introns (in 232 genes) display differential PSI (dPSI) values of 25% or more in the filopodial and cystic stages compared to the other stages, respectively (Figure 9B). In contrast, no retained introns were found to be differentially spliced at the aggregative stage. Most (12 out of 15, 80%) of the analyzed cases of differentially retained introns were validated by RT-PCR (Figure 9C and Figure 9—figure supplement 1). Regulated alternative splicing in C. owzarzaki. (A) Plot of percentage of intron inclusion by intron in rank order for the three studied cellular stages. Filopodial (green) and cystic (blue) stages show higher intron retention levels than the aggregative stage (orange) (p<2.2e-16, Wilcoxon Rank Sum test). (B) Heatmap of PSIs of filopodial- and cystic-specific differentially retained introns across three replicates for each cellular stage. (C) Examples of stage-specific intron retention. (D) Intron length distributions for differentially retained introns in cystic (blue), filopodial (green), and weakly retained introns (gray). (E) Relationship between intron length and retention. Percentage of average intron retention in each of the three cellular stages for different bins of intron size. In the cystic stage, the percentage of intron retention increased with intron length. GO enrichment analysis for the two sets of differentially retained introns showed distinct gene function enrichment (e.g., protein kinase activity and intracellular targeting in the filopodial stage, and histone modification and myosin complex in the cystic stage) (Figure 6), implying that regulated intron retention plays different roles at these stages. 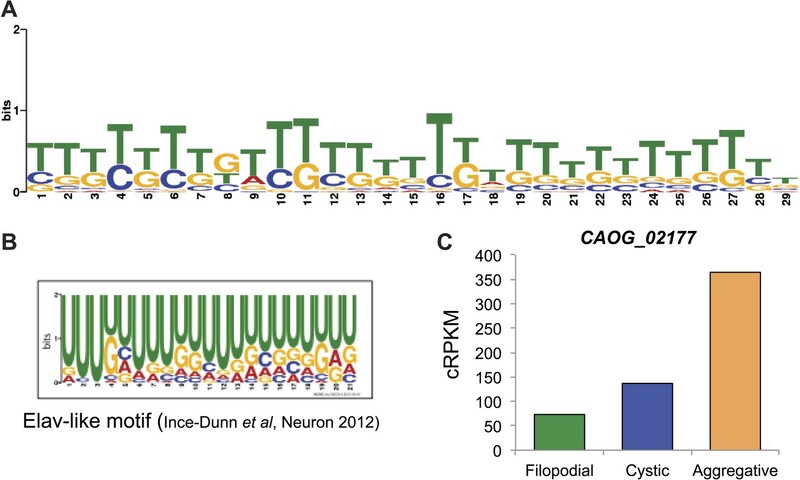 A low fraction of read-through introns (with length-multiples of three and no in-frame stop codons) were found among the two sets of differentially retained introns, suggesting that most if not all of these retained introns act by reducing the levels of spliced mRNAs exported from the nucleus and translated into protein, as has been observed previously for regulated retained introns in metazoan species (Yap et al., 2012). Moreover, we observe that multiple introns belonging to a gene can be retained in a stage-specific manner. For instance, >73% and >29% of multi-intronic genes with one differentially retained intron had at least one additional differentially retained intron at the filopodial or cystic-specific stages, respectively, and 22% and 5% of genes at these stages showed evidence of high retention for all introns in the same genes. Furthermore, RT-PCR analyses and mate information from paired-end read analyses suggested that multiple intron retention events often occur in a combinatorial manner (Figure 9—figure supplement 1), thereby increasing the potential impact of intron retentions on mRNA regulation. All of the above observations were highly consistent across three biological replicates (Figure 9B), and not observed for neighbouring genes, ruling out contamination of genomic DNA. We analyzed different features of differentially retained introns that may account for their stage-specific regulation. First, we compared intron lengths. While filopodial-specific differentially retained introns have a similar length distribution to constitutive (PSI less than 2% across all stages) introns, cystic stage-specific introns were significantly longer (p=1.7e−14 Wilcoxon rank sum test) (Figure 9D). In line with this observation, the average level of intron retention increased steadily with intron length only in the cystic stage (Figure 9E). Furthermore, cystic stage-specific retained introns harbored significantly weaker canonical 5´ and 3´ splice site signals than other intron sets (p<0.0013 Wilcoxon rank sum test for all comparisons). 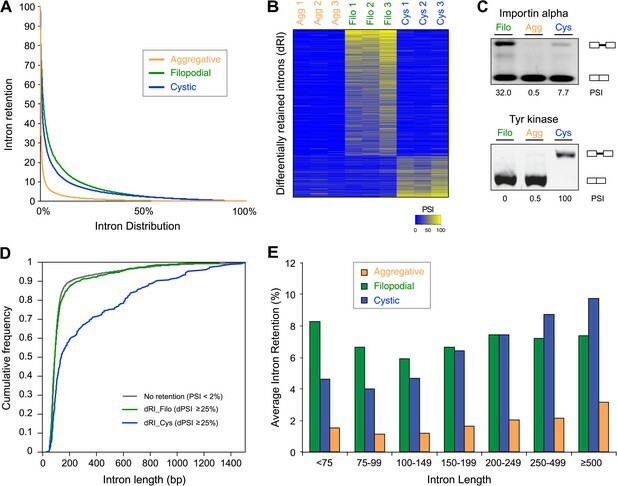 Collectively, these data suggest that differential intron retention in the cystic stage may be associated with suboptimal introns (i.e., long and with weak splice sites) that are more efficiently spliced in the other cell stages. In the case of the filopodial-specific differentially retained introns, analyses of sequence motif enrichment with MEME show enrichment of a long T/G-rich motif that highly resembles a recently identified consensus binding site for Elav-like protein in mammals (Ince-Dunn et al., 2012) (Figure 10). Interestingly, the single ortholog for this gene in C. owczarzaki shows a highly-regulated expression pattern, with lowest expression in the filopodial stage (Figure 10C). Therefore, it is tempting to speculate that Elav-like protein may negatively regulate filopodial-specific intron retention of some introns. Experimental depletion of Elav-like protein in C. owczarzaki will require the development of RNAi or gene-targeting methods in this species before this hypothesis can be tested. Possible role for an Elav-like ortholog in the negative regulation of filopodial stage-specific dRIs. (A) Most significantly enriched motif in filopodial stage-specific dRIs, obtained by MEME. (B) Consensus motif obtained by CLIP-Seq data for an Elav-like member in mammals by Ince-Dunn et al. (2012) and that closely resembles the motif in (A). T∼U. (C) Expression (measured as cRPKMs) of CAOG_02177, a Elav-like ortholog from C. owczarzaki that shows lower expression in filopodial stage. Next, we investigated differential exon splicing and identified 191 cassette exons with PSIs <95% in at least one life cycle stage, 39 of which display PSIs <85%. 29 of these exons showed a ≥15% PSI difference in pairwise comparisons between the cell stages, with lower PSIs typically associated with the filopodial stage (Supplementary file 1); RT-PCR assays confirmed skipping for 7 out of 8 tested cases (Figure 11A, and Figure 11—figure supplement 1). Most (∼60%) of these exons maintain an open reading frame when skipped. In contrast to previous reports demonstrating that differentially-regulated exons are significantly under represented in modular, folded domains in metazoans (Romero et al., 2006; Ellis et al., 2012), two thirds of the differently regulated exons in C. owczarzaki overlap annotated domains (Supplementary file 1). Furthermore, genes with differential exon skipping are statistically significantly enriched in protein kinase activity, impacting both tyrosine and serine/threonine kinases (Figure 11B). This observation strongly suggests a role for coordinated exon skipping in the modulation of cell signaling in C. owczarzaki. To our knowledge, this represents the first example of a regulated exon network linked to a specific biological function in a unicellular organism. Regulated exon-skipping in C. owzarzaki. (A) Examples of exon skipping. (B) Gene set enrichment analysis (GSEA) of the genes containing cassette exons that are differentially-regulated among cellular stages showing high enrichment for protein kinase-associated activities. In summary, our results offer new insight into the origin of metazoan multicellularity. In particular, the observation of an aggregative multicellular stage in C. owczarzaki represents the first example of such cellular behavior in a close unicellular relative of metazoans. This observation therefore adds to the repertoire of reported complex cellular behaviors among extant unicellular relatives of metazoans—including clonal colony formation in choanoflagellates and sporangia formation by hypertrophic syncytial growth in ichthyosporeans (Dayel et al., 2011; Suga and Ruiz-Trillo, 2013), thus expanding the potential starting ‘raw material’ available for the evolution of animal multicellularity. We note that the current evolutionary framework on the opisthokonts, based on phylogenomic analyses (Steenkamp et al., 2006; Ruiz-Trillo et al., 2008; Shalchian-Tabrizi et al., 2008; Torruella et al., 2012; Paps et al., 2013), discards the possibility that C. owczarzaki (or choanoflagellates) derives from a more complex multicellular lineage. The sister-group of opisthokonts is the unicellular biflagellates Apusozoa, and complex multicellularity has not yet been observed in any of the non-metazoan holozoan lineages. Furthermore, we show that the complex, metazoan-like genetic ‘toolkit’ of C. owczarzaki (Sebé-Pedrós et al., 2010, 2011; Suga et al., 2012) is dynamically deployed during its highly-regulated life cycle, with upregulation of integrin adhesome and signalling genes linked to multicellularity in metazoans during the aggregative stage. Extensive differential AS between the C. owczarzaki life cycle stages likely further contributes to the dynamic gene regulation observed in this species, with differential intron retention likely acting as an important mechanism in the control of transcript levels between life cycle stages, probably through triggering non-sense mediated decay (NMD). Our discovery of an exon network associated with tyrosine kinase genes in C. owczarzaki further adds to the metazoan-like features of this species. Together with genes resembling those that function in metazoan multicellular processes, the emergence of an exon network that functions in conjunction with differentially-regulated intron retention may have provided a degree of proteomic and regulatory complexity that was key in the evolution of cell type complexity in metazoans (Nilsen and Graveley, 2010). Based on the collective results from our investigation of C. owczarzaki, it is intriguing to consider that the integration of regulatory innovations involving differential expression and splicing of metazoan-like genes set the stage for the evolution of cell specialization in the common ancestors of metazoans and C. owczarzaki. C. owczarzaki cells of the corresponding stage were fixed for 1 hr with 2.5% glutaraldehyde (Sigma-Aldrich, St. Louis, MO, USA), and for another hour with 1% osmium tetroxide (Sigma-Aldrich), followed by dehydration in a graded ethanol series (25%, 50%, 70%, 99%) for 15 min per step, followed by three 15-min rinses in 100% ethanol. Samples were critical-point dried in liquid CO2 using a BAL-TEC CPD 030 critical-point drying apparatus. They were subsequently glued to SEM stubs with colloidal silver, sputter-coated with gold-palladium, and examined with a Hitachi S-3500N (Hitachi High-Technologies Europe GmbH, Krefeld, Germany). Cell aggregates were loaded into the copper tubes and immediately cryoimmobilized using a Self-Pressurized Freezing System (EM SPF) (Leica-Microsystems, Vienna, Austria). The cells were then stored in liquid nitrogen until further use. Peeled copper tubes were freeze-substituted in anhydrous acetone containing 2% osmium tetroxide and 0.1% uranyl acetate at −90°C for 72 hr and warmed to room temperature, following a 2°C increase per hour in five consecutive steps (−60°C, −30°C, 0°C, 4°C, and room temperature) with a total of 8 hr at each temperature and using an EM AFS (Leica-Microsystems, Vienna). After several acetone rinses, samples were infiltrated with Epon resin during 7 days and embedded in resin and polymerised at 60°C during 48 hr. Ultrathin sections were obtained using a Leica Ultracut UC6 ultramicrotome (Leica-Microsystems) and mounting on Formvar-coated copper grids. The sections were stained with 2% uranyl acetate in water and lead citrate, and were observed in a Tecnai Spirit 120 kv electron microscope (FEI Company, Eindhoven, Netherlands) equipped with a Megaview III CCD camera. C. owczarzaki cells were grown axenically in 5-ml flasks with ATCC medium 1034 (modified PYNFH medium) in a 23°C incubator. Three biological replicates (three independent cell lines) were generated by subculturing from a single-founding cell and grown for 2 months. Adherent filopodiated cells were obtained by initiating a new 1/100 sub-culture (from an approximately 5 × 106 cells/ml initial culture) and, after 3–4 days, cells were scratched from the substrate. 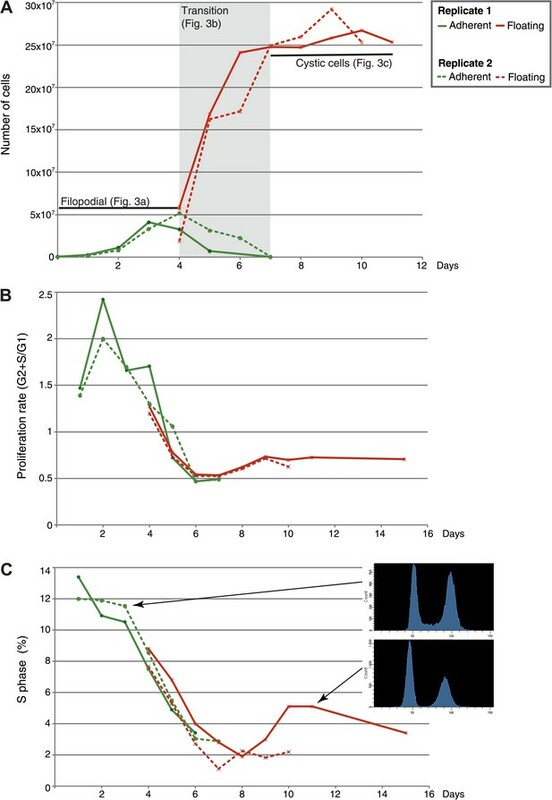 Aggregate formation was induced by initiating a new 1/250 sub-culture (from an approximately 5 × 106 cells/ml initial culture) and by gentle agitation at 60 rpm during 4–5 days. Finally, floating cystic cells were obtained from a 14-day-old culture, starting from a new 1/100 sub-culture (from an approximately 5 × 106 cells/ml initial culture). Two different groups of cells (from two different starting cultures, 5 ml flasks with a cell density of 106 cells/ml, consisting exclusively of adherent filopodial cells) were stained either with 75 nM (in PBS1x) Lysotracker Green DND-26 (Life Technologies, Carlsbad, CA, USA) or with 1 μM (in PBS1x) Chromeo Live Cell Mitochondrial Staining Kit (Active Motif Inc, Carlsbad, CA, USA). The cells were stained for 30 min at 23°C. After staining, 1/3 of the cells from the two differentially stained populations were mixed in a new culture flask and the remaining 2/3 of cells for each staining were kept as a control. All three cultures were grown for 2 hr and then the aggregate formation was induced (see above, ‘Results and Discussion’). 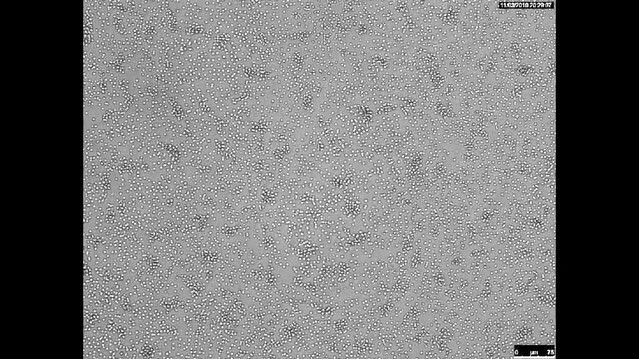 After 8 hr, aggregates were visualized in poly-L-lysine covered (Sigma-Aldrich, St. Louis, MO) glass-bottom plates in a Leica TCS SP5 confocal microscope (Leica-Microsystems). C. owczarzaki cell division was blocked using 100 mM hydroxyurea (Sigma-Aldrich) or 25 μg/ml aphidicolin (Sigma-Aldrich). The effect of both drugs was evaluated by following cultures treated with each drug during 7 days, using Neubauer chamber. The cells were cultured in 16-multiwell plates and with an initial density of 5 × 104 cells/ml. Once these conditions were established, different cultures were treated with each drug for 1 day and, then, aggregate formation was induced (see above). 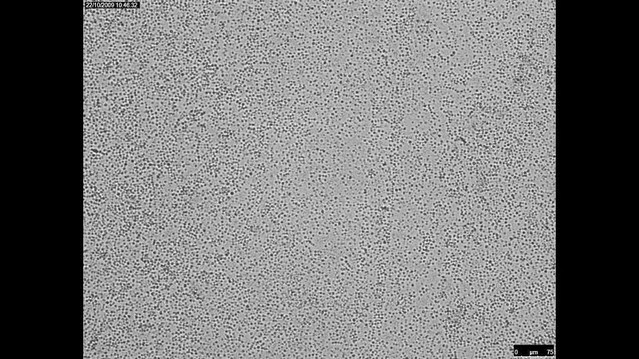 2 days later, the formation of aggregates was visualized in poly-L-lysine covered (Sigma-Aldrich) glass-bottom plates in a Leica TCS SP5 confocal microscope (Leica-Microsystems). C. owczarzaki cells were grown in 5-ml flasks with ATCC medium 1034 (modified PYNFH medium) in a 23°C incubator. Total RNA from each cell stage (and from three biological replicates from each stage) was extracted using Trizol reagent (Life Technologies). Nine libraries were sequenced over 2 lanes HiSeq 2000 instrument (Illumina, San Diego, CA, USA), generating a total of 197M 76-base paired reads. Reads were aligned to the reference genome using Tophat (Trapnell et al., 2012) with default options and specifying that this was a strand-specific sequencing, rendering an average mapping of 90%. Significant differential expression was calculated by performing pairwise comparisons with DESeq (Anders and Huber, 2010) (threshold 1e-05), EdgeR (Robinson et al., 2010) (threshold 1e-05), CuffDiff (Trapnell et al., 2012) (threshold 1e-05) and NOISeq (Tarazona et al., 2012) (threshold 0.8) and only genes that appear to be significant at least in three out of the four methods were considered as differentially expressed. Quality control analyses of the data were performed using cummeRbund R package (Trapnell et al., 2012). These include count vs dispersion plot to estimate over-dispersion, density plot to assess the distributions of FPKM scores across samples and squared coefficient of variation plot to check for cross-replicate variability. A gene ontology of C. owczarzaki’s 8637 genes was generated using Blast2GO (Conesa et al., 2005) and GO enrichments of the different lists of differentially expressed genes (see above) were analyzed using Ontologizer (Bauer et al., 2008) using the Topology-Weighted method. A p-value threshold of 0.01 was used. The results from Ontologizer were loaded into Enrichment map cytoscape plug-in (Merico et al., 2010) to generate a network visualization. Pfam domains of all genes were analyzed using Pfamscan v26 with default Gathering Threshold, and counts were generated using custom Perl scripts. Fisher’s exact tests were performed using custom R scripts and a p-value threshold of 0.01 was used. Exon skipping and intron retention were analyzed as previously described (Curtis et al., 2012; Han et al., 2013). In short, for exon-skipping analyses, multifasta libraries of exon–exon junctions were built by combining all forward annotated splicing donors and acceptors. A minimum of eight base pairs was required at each boundary to assure specificity. Next, the number of effective mappable positions was calculated for each exon–exon junction, as previously described (Labbé et al., 2012; Barbosa-Morais et al., 2012). Then, RNA-seq reads (previously trimmed to 50 nucleotides and combining each three replicates to increase read depth) were aligned to these sequences using Bowtie, with−m 1 −v 2 parameters (single mapping and two or fewer mismatches). Percentage of exon inclusion was calculated and a minimal read coverage was required, as previously described (Khare et al., 2012). For intron retention, a similar approach was taken for each contiguous intron–exon and exon–exon junction, and percentage of intron inclusion (PSI, Percent Spliced In, the percentage of transcript for a given gene that contain the intron) was calculated as previously described (Curtis et al., 2012). For comparisons among cellular stages, only events with enough read coverage in the three samples were considered (either (i) ≥10 reads in the exon–exon junction or (ii) ≥10 reads in one intron–exon junction and ≥5 in the other), and introns showing >95% inclusion in the three samples were discarded. To assess whether differentially retained introns in the same genes were included in a coordinated or in a combinatorial manner, mate information of read pairs was used. If each end of a read mapped to two different intron retention events, each end may be providing support for retention of both introns or splicing of both introns (coordinated regulation), or retention of one and splicing of another (combinatorial intron retention). For the 555 pairs of retained introns that had read mate information, 196 (35.3%) showed evidence for combinatorial regulation. Finally, for sequence motif enrichment analyses, full intron sequences were compared using MEME (Bailey et al., 2009). To validate AS analysis predictions, the three stages were induced (RNA-Seq and analysis sections) and RNA was extracted using Trizol reagent (Life Technologies). To eliminate genomic DNA, total RNA was treated with DNAse I (Roche, Basel, Switzerland) and purified using RNeasy columns (Qiagen, Venlo, Netherlands). For each stage, cDNA was produced from 1 μg of total RNA using SuperScript III reverse transcriptase (Life Technologies). Pairs of primers of similar melting temperature (60°C) and spanning the putative alternatively spliced segments were designed using Geneious software. PCR was performed using ExpandTaq polymerase (Roche). C. owczarzaki cells were grown for 10 to 15 days, sampling every day from both the supernatant (to obtain floating cells, which after day 7 are completely encysted) and the scratched flask (to obtain filopodial adherent cells). Thus, two samples were obtained daily, for floating and adherent cells. For DNA-content analysis, a sample was fixed using 70% ethanol and stored at −20°C for one month. The samples were subsequently fixed and stained with Propidium Iodide (as described in Darzynkiewicz and Huang, 2004) and DNA content estimated using FACScalibur flow cytometer (Becton Dickinson, Franklin Lakes, NJ, USA). For cell counting, 1 ml of fresh sample (one from the supernatant and one from the flask surface) was mixed in a BD Trucount Tube (Becton Dickinson), with a known number of beads, so absolute cell number counts could be calculated, using an LSR Fortessa flow cytometer (Becton Dickinson). Two replicate experiments (R1 and R2) were performed independently in order to confidently establish growth dynamics. Two measures were calculated from the DNA-content analysis. First, the proliferation rate, which indicates the proportion of number of cells in S and G2/M phases vs the number of cells in G0/G1. Second, the percentage of cells in S-phase. Philosophical Transactions of the Royal Society of London B Biological Sciences 364:2809. European Journal of Protistology 48:103–123. Molecular Biology and Evolution 26:2699–2709. Biol J Linn Soc Lond 72:509–517. Journal of Molecular Evolution 56:540–563. 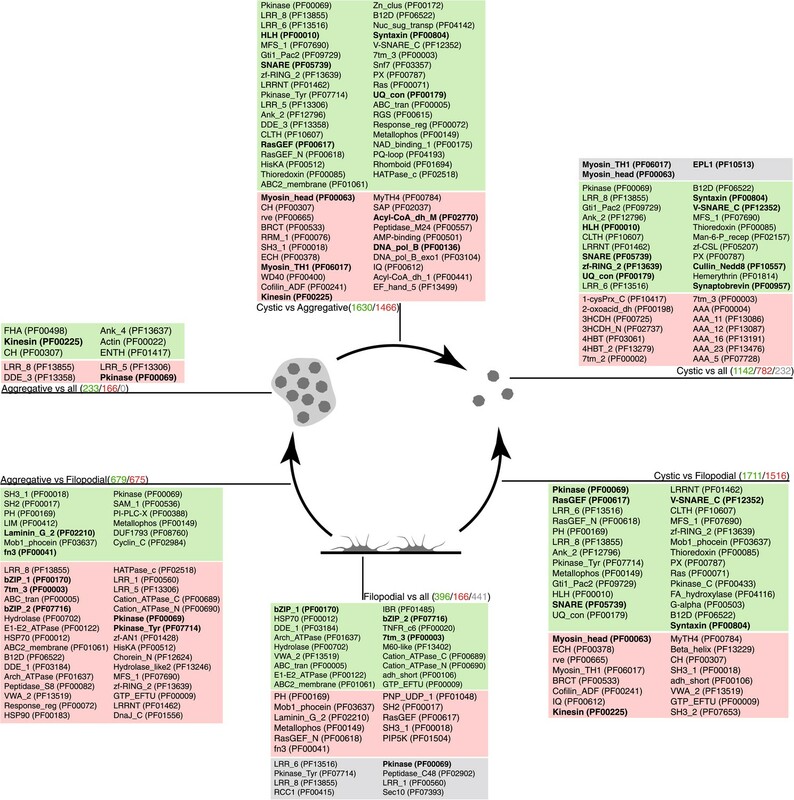 Current Protocols in Immunology 60:5.7.1–5.7.18. The evolution of multicellularity: a Minor major transition? Annual Review of Ecology, Evolution, and Systematics 38:621–654. Current Opinion In Cell Biology 24:323–332. Nature structural & molecular biology 19:1037–1043. Philosophical Transactions of the Royal Society of London B Biological Sciences 365:819–830. Annual Review of Earth and Planetary Science 39:217–239. The Journal of Eukaryotic Microbiology 48:604–607. Journal of Cell Science 99:657–668. Proceedings of the National Academy of Sciences of the United States of America 104:8613–8618. Journal of Invertebrate Pathology 35:26–33. Current Opinion In Genetics and Development 18:472–478. Proceedings of the National Academy of Sciences of the United States of America 103:8390–8395. Molecular Biology and Evolution 25:664–672. Molecular Biology and Evolution 30:2013–2023. Molecular Biology and Evolution 28:1241–1254. Proceedings of the National Academy of Sciences of the United States of America 107:10142–10147. Molecular Biology and Evolution 23:93–106. Molecular Biology and Evolution 29:531–544. Journal of Experimental Zoology 5:245–258. Thank you for sending your work entitled “Regulated multicellularity in a close unicellular relative of Metazoa” for consideration at eLife. Your article has been favorably evaluated by a Senior editor and 3 reviewers, one of whom is a member of our Board of Reviewing Editors. The paper describes a new aggregative stage for a unicelllular taxon (Capsospora). Because of its relationship to animals and the Choanoflagellata, Capsaspora is becoming an increasingly important model organism for reconstructing animal origins. For example, Capsaspora has a number of genes in its genome that seem to be missing from the Choanoflagellata. What has not been clear is the extent to which the study of Capsaspora cell biology (beyond the study of its genome) will help to illuminate animal origins. 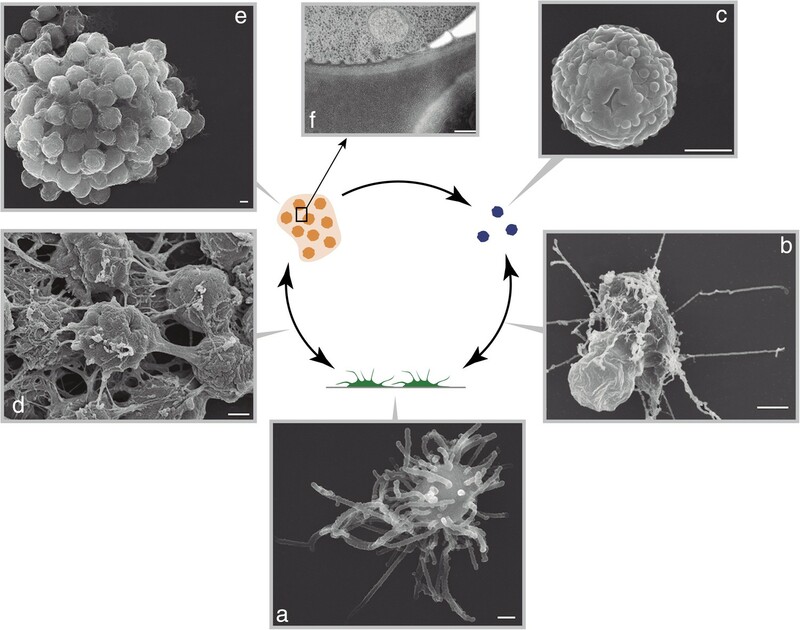 This paper begins to address that question by describing the life history of Capsaspora, with a focus on its ability to form multicellular aggregates. The images in Figure 1 nicely document the morphology of various differentiated cell types. The authors further report that the life history of Capsaspora is associated with regulated and coordinated changes in transcriptional regulation and in mRNA splicing. The transition to cell aggregation in particular is associated with differential transcription of genes that are also involved in the regulation of development and cell adhesion in animals, raising the possibility that the clonal multicellularity of animals evolved through the co-option of genes that previously functioned in cell aggregation. However, the manuscript in its present form does not entirely document several of the key bioinformatics analyses, such that it is difficult to assess if their results are truly meaningful, or if there is cherry picking in the results. A primary concern is that the authors observe that a significant portion of the genome is differentially transcribed during the life cycle of C. owczarzaki, yet they are making the leap to very specific molecular pathways that are linked to these life cycle stages. As the analyses to generate gene expression lists that are significantly correlated are not fully documented, it is impossible to evaluate if the authors are indeed making a significant advance in our understanding of multicellular evolution, or if they are selectively highlighting one of many interesting pathways that change during the life cycle of C. owczarzaki. 4) that multicellularity in Capsaspora has the potential to be informative about the origin of multicellularity in animals. The following substantial concerns were raised by referees #2 and #3 and need to be addressed in a revised version. Please pay particular attention to the point that “Lists of genes” are not particularly useful on their own; what is key are the functions associated with evolving multicellularity. The referees feel that this is the crucial aspect that should come out of this paper to make it suitable for publication in eLife. 1) The authors assert that the multicellular stage of the Capsaspora life cycle forms through aggregation, but the evidence for it (Videos 2 and 3) is unconvincing. I see that clumps are forming, but it is possible that the clumps could be forming clonally (i.e., through cell division) rather than through aggregation. A more convincing presentation would be higher magnification time-lapse microscopy and false-coloring of individual cells prior to aggregation to show that they transition from being solitary to being members of an aggregant. 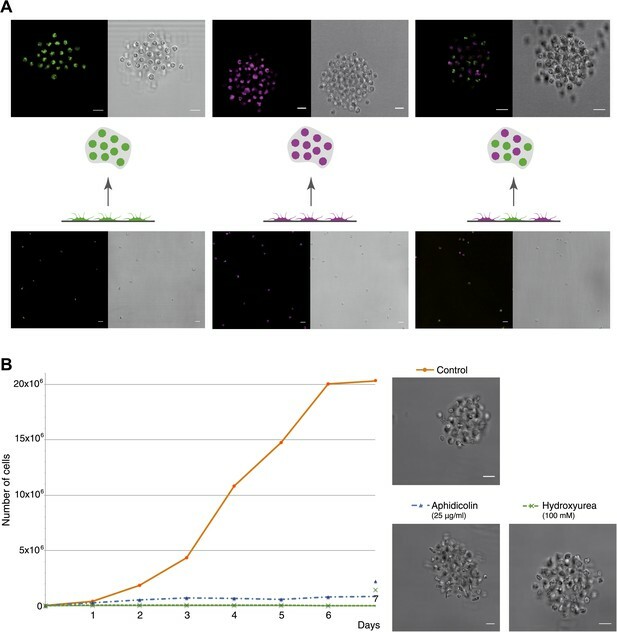 Even this would only show that aggregation is possible, while not eliminating the possibility that multicellular forms of Capsaspora can also develop through cell division. 2) It would be helpful if the authors would devote more space to discussing plausible alternative scenarios regarding the origin of multicellularity along the animal stem lineage. The authors imply that the last common ancestor of animals and Capsaspora had aggregative behavior (e.g., see the last sentence of the Abstract), but it is also possible that aggregation in Capsaspora is derived within the Filasterea. The argument in favor of an “aggregative” ancestor would be strengthened by citing and discussing the work of James Nelson's group on Dictyostelium (e.g. ,PMID 22930590 and PMID 21393547). On the other hand, the study of Creolimax from the corresponding author's lab shows another, alternative route to multicellularity, in which a syncytium forms and is subsequently cellularized. In this case, the multicellular form is clonal, as it is in Choanoflagellata and animals. Because Creolimax is an outgroup of the clade containing Capsaspora, Choanoflagellata, and animals, it is plausible that their last common ancestor formed multicellular structures clonally and that the aggregative process saw Capsaspora evolved within the Filasterea. Some of these alternative scenarios were nicely discussed in the Creolimax paper and should be revisited in this paper in light of the results from Capsaspora. 3) The transcriptional regulation/splicing section of the paper. This comes down to a matter of taste, and the state of the field of functional genomics. I found this section to be useful as a platform for future research (it is obviously good to know which genes are turned on and off or alternatively spliced, and when), but not particularly insightful. For example, it's not clear which specific genes regulate aggregation, nor is it clear whether aggregation in Capsaspora is homologous with the aggregative behaviors seen in some animal cells. In past functional genomics papers it was considered interesting to know which GO terms were enriched, but I think these types of analyses are now better suited to specialist journals. The data and findings from the RNA-seq experiments should definitely be published, but I'm not sure that they are of sufficient general interest as currently presented. A better distillation of the data might reveal a gem that is currently buried. Perhaps a more clear presentation and emphasis of the alternative splicing data would help. 1) A key limitation of this work is that the authors show that approximately half the genome is differentially transcribed at each of the life cycle stages. The authors then somehow whittle these genes down to a list of candidate genes that they associate as being important for each of the life cycle stages. While these analyses seem to draw interesting conclusions, it is not apparent that the authors have actually tested against a null hypothesis. 2) Functional testing of these candidate genes has not been done (e.g., RNAi of the candidate genes to test for life cycle defects). However, it may not be possible in this non-model system. If functional analyses cannot be done then it is critical that the authors carefully analyze and document their methods so they can move beyond “lists of genes” and toward the functional insights they have made. This major criticism goes hand-in-hand with point #4 that the bioinformatics analyses need more explanation. I would be less worried about this point if point #3 were to be comprehensively addressed in a revised manuscript. 3) Supplementary file 1: CAOG_03572, is the isoform above the exon skipped form? CAOG_07148, what is the isoform in the Filo stage just above the exon skipped isoform? CAOG_05784, What are the isoforms just below the inclusion isoform? Either the RT-PCR is not working as intended or there are potentially many other splice isoforms present. 4) There are several instances where the authors cite “significant enrichment of” an annotated function where they point to network diagrams presumably derived from cytoscape. As these are key conclusions in the paper, documentation of how these were derived as cytoscape analysis of pathway enrichment is not a standardized analysis. Data specifically noted are Figure 4B and Figure 9B. My concern with these types of enrichment analyses are if the authors are specifically looking at genes they are interested in, or are annotated, versus actually testing against the null hypothesis. For example, are protein kinases actually more likely to have exon skipping than just any random set of genes in the genome (Blast2Go annotated or not)? What is the actual meaning of “genes with differential exon skipping are significantly enriched in protein kinase activity” and other related statements? These are key conclusions to this paper and as submitted it is difficult to evaluate if these statements are indeed true. Indeed, the authors claim, regarding protein kinases, that “[t]his represents the first example of a regulated exon network linked to a specific biological function in a unicellular organism”. This conclusion needs more documentation of how it was reached for me to agree. A major argument that colonies form by aggregation rather than clonal division is that the aggregates are detected within a few hours, whereas the doubling time of a normal culture during exponential growth is approximately 24 hours. This is shown in Video 1. To provide further support for the formation of aggregates we have provided results from additional experiments. First, we used two live staining protocols (Chromeo Live Cell Mitochondrial Staining Kit and Lysotracker Green DND-26) that appear to be efficient (staining virtually all cells in the culture), stable (remaining for days), and non-toxic (with the cells exhibiting normal morphological shape and behavior) in C. owczarzaki. We mixed two populations of differentially stained cells (one with Chromeo Live Cell and another with Lysotracker Green) and obtained aggregates with cells from both populations, indicating that colonies form indeed by aggregation of multiple individuals. This experiment is described in the text and shown in the new Figure 4A. Second, we performed DNA content analyses by flow cytometry of aggregates and found that the proliferation rate is negligible, indicating that little cell division occurs in aggregates. This result is also now included in Figure 4–figure supplement 1. Finally, we show that the cell cycle blocking drugs hydroxyurea and aphidicolin that effectively block cell division in C. owczarzaki do not prevent formation of cell aggregates. This strongly indicates that clonal division is not required for the formation of aggregates. These new results are included in the new Figure 4B. “Regulated aggregative multicellularity in a close unicellular relative of Metazoa”. We agree that the evidence to support this claim is not strong and therefore have removed the statement from the manuscript. It should also be noted that this is not a major point of our paper; addressing it would be very time consuming yet any outcome would not alter the main conclusions of our manuscript. There are, unfortunately, no available genetic tools in Capsaspora to specifically address this question at a molecular level. However, we believe that this does not undermine our main novel message, which is to highlight that transitions between the different cell stages of Capsaspora are highly regulated at the transcriptomic level and that this regulation has features in common with metazoans. We have, nonetheless, made a strong effort to make the datasets as comprehensive and informative as possible to serve as a basis for future research, as suggested by Reviewer 2. We may have failed to stress this in the previous version and have thus modified several parts of the manuscript to address this point. We strongly believe that studying different close unicellular relatives of animals (rather than just one) is the only way to infer ancestral cellular and genomic characteristics of the unicellular ancestor of metazoans. Therefore, our new description of unique features in the life cycle of Capsaspora further expands the possible range of cell types and behaviors (the “starting raw material”) of the unicellular ancestor of Metazoa. Moreover, the high regulation that we observe and describe (which affects metazoan-like genes), provides a new framework with which to further analyze the role that gene regulation may have played in the unicellular to multicellular transition that gave rise to metazoans. We have expanded the Discussion with a new paragraph to address the reviewer’s point. Please see response to Point 1 above. 2) It would be helpful if the authors would devote more space to discussing plausible alternative scenarios regarding the origin of multicellularity along the animal stem lineage. The authors imply that the last common ancestor of animals and Capsaspora had aggregative behavior (e.g., see the last sentence of the Abstract), but it is also possible that aggregation in Capsaspora is derived within the Filasterea. The argument in favor of an “aggregative” ancestor would be strengthened by citing and discussing the work of James Nelson's group on Dictyostelium (e.g., PMID 22930590 and PMID 21393547). On the other hand, the study of Creolimax from the corresponding author's lab shows another, alternative route to multicellularity, in which a syncytium forms and is subsequently cellularized. In this case, the multicellular form is clonal, as it is in Choanoflagellata and animals. Because Creolimax is an outgroup of the clade containing Capsaspora, Choanoflagellata, and animals, it is plausible that their last common ancestor formed multicellular structures clonally and that the aggregative process saw Capsaspora evolved within the Filasterea. Some of these alternative scenarios were nicely discussed in the Creolimax paper and should be revisited in this paper in light of the results from Capsaspora. We agree with the reviewer that this is an interesting point of discussion and speculation, and we have now extended our discussion of this topic at the end of the first paragraph of the Results and Discussion. The referee is right to point out that there is no clear homology between the aggregative behavior seen in Capsaspora and the one seen in some animal cells, yet we respectfully disagree that our data on the transcriptiomic regulation of Capsaspora’s aggregative behavior is not insightful. A major open question raised by the finding that Capsaspora has a complex repertoire of genes involved in multicellularity (Suga et al. Nat Commun 4, 2325 (2013)), as also seen for choanoflagellates (King et al. Nature 451, 783-788 (2008); Fairclough et al. Genome Biol 14, R15 (2013)) is whether differential gene regulation played an important role in the origins of multicellularity; however, gene regulation among unicellular relatives of Metazoa remains poorly understood. In our manuscript we provide the first description of transcriptomic changes associated with transitions between different cell stages in Capsaspora, both at the level of mRNA expression and alternative splicing. The nature of the genes that are differentially regulated is highly suggestive of possible mechanisms that underlie origins of multicellular. As such, we strongly feel that our observations provide an important basis for future investigation into animal origins. We have made changes to the text (as summarized above) to more clearly present our findings and their importance in terms of evolutionary implications. We agree that this was not clear enough. We want to stress that we did not follow a “candidate”-driven approach, as the reviewer suggests. Instead, we used statistical enrichment tests (four of them) for both Gene Ontology terms and also all Pfam domains. The results of these tests were manually curated only to remove redundancy (in the case of nested GO terms). Therefore, the enriched functional categories that we report were found in a completely unbiased way. Then, we selected some categories that were significantly enriched in one stage and that were particularly interesting from an evolutionary perspective, such as the integrin adhesome, and examined them more closely gene-by-gene. We have modified the Materials and methods to clarify how we performed our analyses. 2) Functional testing of these candidate genes has not been done (e.g., RNAi of the candidate genes to test for life cycle defects). However, it may not be possible in this non-model system. If functional analyses cannot be done then it is critical that the authors carefully analyze and document their methods so they can move beyond “lists of genes” and toward the functional insights they have made. This major criticism goes hand-in-hand with point #4 that the bioinformatics analyses need more explanation. I would be less worried about this point, if point #3 were to be comprehensively addressed in a revised manuscript. We completely agree with the reviewer that functional testing such as knocking- down some of the candidate genes that regulate life cycle transitions would be ideal. However, and as the reviewer rightly guesses, no such methods are yet available for Capsaspora, and addressing this would be beyond the scope of the present manuscript, given the major technical challenges involved. To address the reviewer’s other concern, we have provided a more detailed description of the analysis and statistical methods used in our paper. An extra band above the inclusion isoform is often observed when simultaneously amplifying two isoforms due to formation of a heteroduplex between one DNA strand from each isoform (these have long stretches of perfect sequence complementarity). Since the heteroduplex forms unpredictable secondary structures its formation varies between PCR reactions. In some cases it is also possible that unspecific bands are amplified in the PCR reaction. Nevertheless these effects do not impact the validation of the alternative splicing events in our study as we have confirmed the identity of the inclusion and exclusion isoforms by Sanger sequencing. We have added a note in the legend to acknowledge the presence of heteroduplexes in the RT-PCR reactions, and to confirm that the specific products have been confirmed by sequencing. We apologize for the lack of clarity and we have made a significant effort to better explain the methods used. We tested GO enrichment by using Ontologizer, and not by “specifically looking at genes we were interested in”. What Ontologizer does is to test whether within a particular list of genes (in this case, genes that were found to be significantly overexpressed in one stage vs another) there is an overrepresentation of any GO (tested against the full list of genes and its associated GOs, the null hypothesis thus being that the proportion of genes for a specific GO category in the subset is a representation of the proportion of genes of these category in the complete list). We used the Topology-Weighted option to avoid having to apply a multiple hypothesis correction on the obtained p-values. Then, we used a p-value threshold of 0.01. The cytoscape networks, which seems to concern the reviewer as well, were built after the Ontologizer analysis had been done. That is, the network is only a visualization tool of the results obtained by Ontologizer (including number of genes in each GO, p-values, etc). Therefore, in response to answer the reviewer’s concern, protein kinases are significantly enriched for exon skipping when comparing any random set of genes in the genome. We thank Joshua Levin and Lin Fan for generating RNA-Seq libraries and the Broad Institute Genomics Platform for Illumina sequencing. The authors are grateful to Carmen López Iglesias of the Cryo-Electron Microscopy unit (CCiT-UB) for her help and advice on electron microscopy. We also thank Cristina Peligero, for her help in performing and interpreting the flow cytometry results, Ignacio Maeso for critical reading of the manuscript, and Professor Yves van de Peer, Stephane Rombauts and Brian Haas for their advice. ASP is supported by a pregraduate Formacion Profesorado Universitario grant from MICINN. MI is supported by a postdoctoral fellowship from the Human Frontiers Science Program Organization. BJB acknowledges grant funding from the Canadian Institutes of Health Research. © 2013, Sebé-Pedrós et al. Could the transient aggregation of unicellular organisms have paved the way for the evolution of the multicellular animals?